Completely hand-made bangle bracelet, with silk organza and cotton butterflies. Then I printed them on high quality silk organza and cotton, cut and fixed using antique bronze findings. Wearing this bangle bracelet you wear a butterfly! 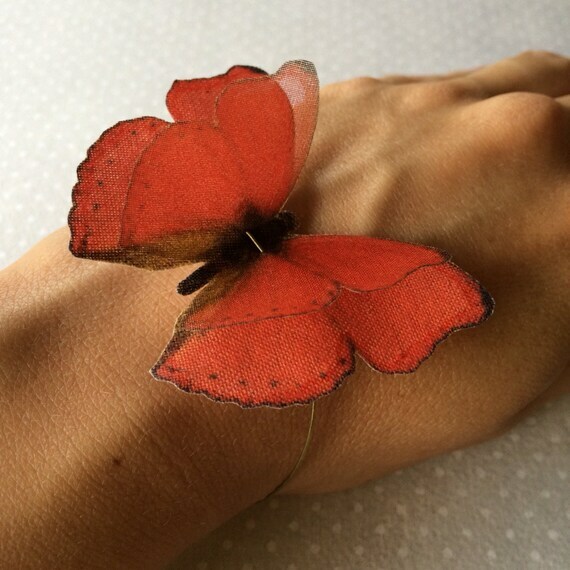 There are 2 butterflies on this bangle bracelet, and they measure about 6.5 cm. Antique bronze heavy duty wire and findings. If you need a smaller or larger size please leave me a note at checkout. I’ll ship the bracelt gift wrapped, for you or your loved one. 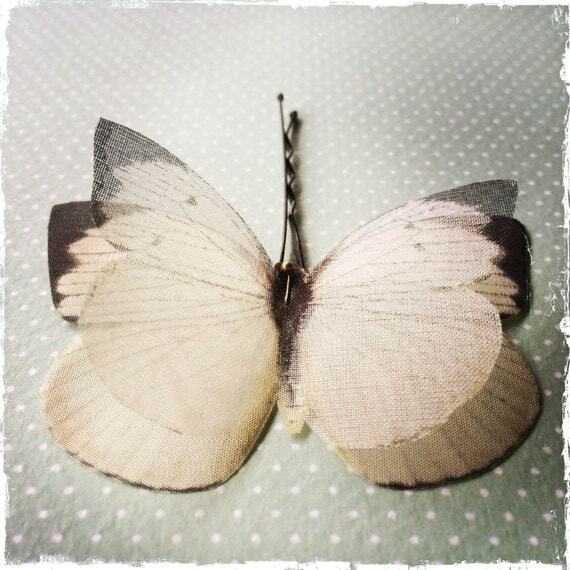 Lovely hand-made bobby pin with IVORY butterflies. Butterflies bobby pin is delicate. You can wear it on your hair every day but don’t stretch butterflies, don’t wash (also if they are waterproof). This bobby pin is made using 2 butterflies: the large one is made of 100% silk and measure 7 x 4.5 cm. The small one is made of silk organza. 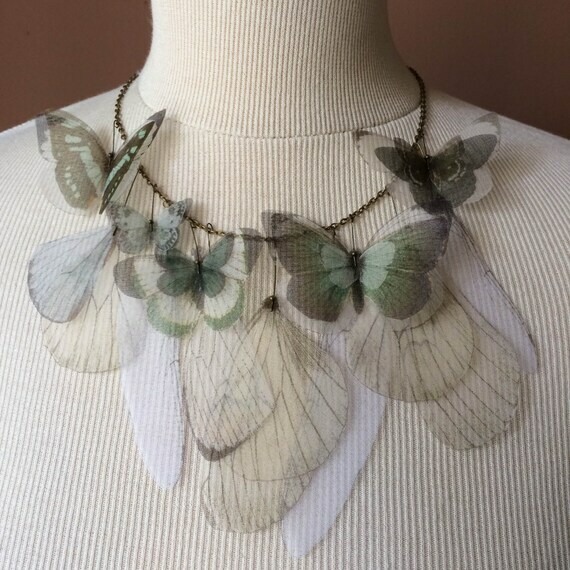 This romantic necklace is a OOAK piece, handmade using vintage ivory butterfly lace and ivory glass pearl. I used antiqued bronze chain (long about 45cm) and a 30x40mm oval lace scalloped central tray. 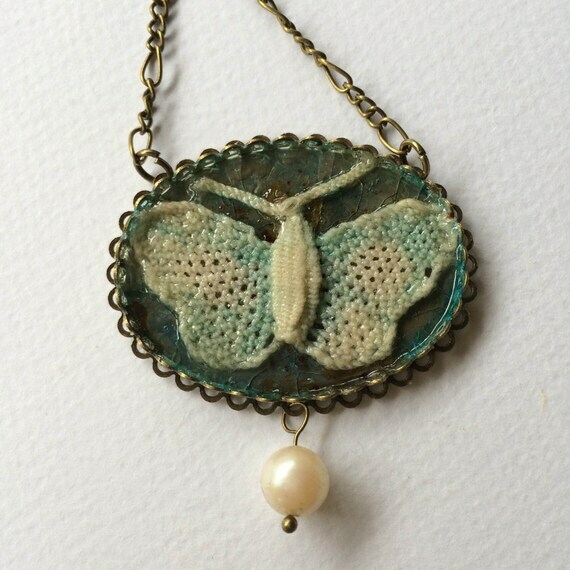 Glazing the butterfly lace, I created a unique patina.. it is simply lovely! I’ll ship this necklace gift wrapped with Priority airmail, cheapest and fastest way but not trackable then I highly recommend to choose Registered airmail as I’m not responsible for lost, stolen or damaged items by post office. Please convo me for registered airmail charge BEFORE to buy this item, thanks! Feel free to email me (convo me) should you have questions, need further descriptions or pictures. A romantic, vintage inspired, bracelet. 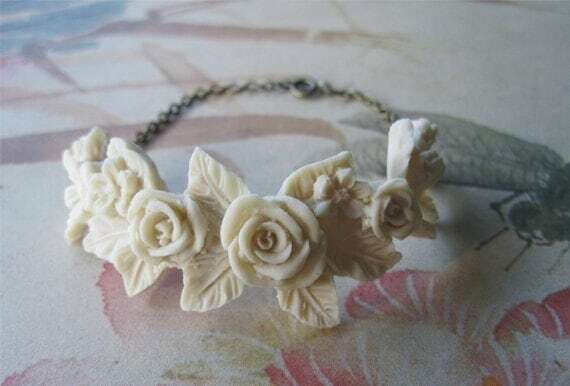 Matte finished ivory flowers with antique brass chain and spring clasp. It can be custom made in almost any color or using silverplated chain and clasp. The chain length measure about 11cm. The flowers focal bead are 11 cm. long. Each focal beads is handmade by me with resin. I’ll ship the bracelet well packaged with Priority airmail, cheapest and fastest way but not trackable then I highly recommend to choose Registered airmail as I’m not responsible for lost, stolen or damaged items by post office. Choosing Registered airmail, you’ll receive the tracking number, then you can track your package in www.poste.it/en web. Antique bronze chain is long about 45 cm. Spring clasp with butterfly. The necklace shown is sold, but a new one very very similar, will be made for you. 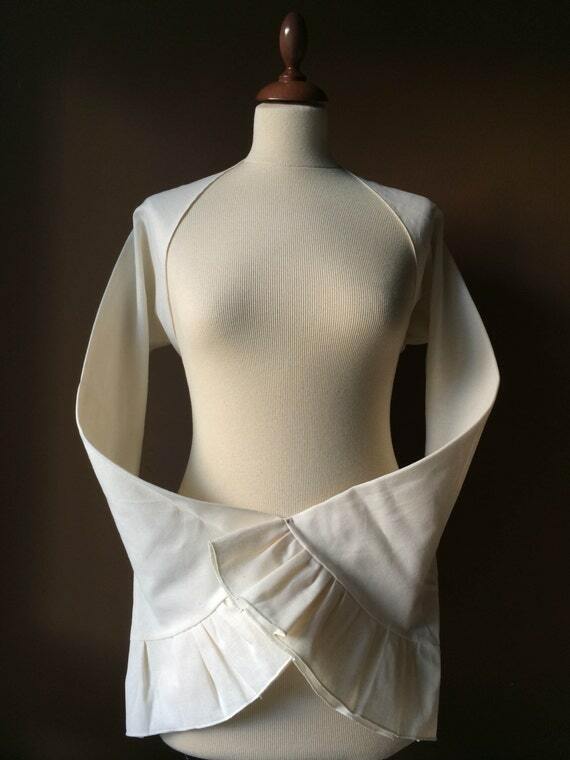 Hand-drawn and handmade shrug bolero in 100% ivory cotton (not elastic). From arm to arm is over 150 cm.